We’ll be the first to say that learning a foreign language isn’t always easy. 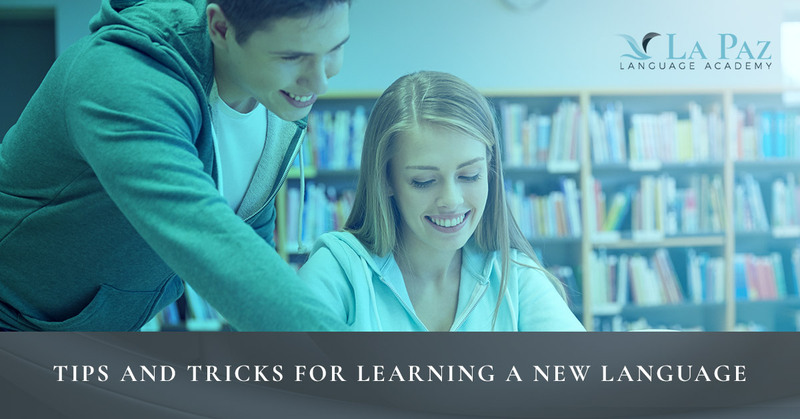 As with math, science, social studies, and other core curricula, everyone learns new languages at a different pace, and it all boils down to knowing how to optimize your own learning style. At La Laz Language Academy in El Paso, our native-speaking teachers work closely with their students to ensure that they are getting the most out of our language learning programs while learning at their own pace. That being said, here are some tips and tricks for successfully learning a new language! When learning a new language, it’s important to start with the basics. Words and phrases like “hello,” “thank you,” and “what’s your name?” will serve as the foundation for the rest of your language learning experience, so take an inverted approach when learning a new language by starting with the basics and adding on as you progress. Taking language classes or learning on your own is exciting, but remember to take it slow so you don’t bite off more than you can chew and get overwhelmed. Another language learning technique that has proven effective is attaching a unique meaning to foreign words and phrases. Just think of it as if you were preparing for a history test. You wouldn’t simply recite questions and answers over and over without making sense of the connection, and if you were, you likely wouldn’t remember the correct answers during the test. The same goes for learning a new language. If you are learning French and find that you always forget the word “pomme,” or apple, think of it fitting into the “palm” of your hand. Though it might sound ridiculous, attaching some kind of meaning to foreign words will help you tremendously when you try to recall them later. Immersing yourself in the target language and culture is by far the best way to learn a language — just ask those of us who have traveled internationally or lived in a foreign country. Unlike taking a language course in a classroom, traveling to a foreign country forces you to navigate through your day-to-day life in an entirely different way as you use the target language to accomplish basic tasks. Finding the restroom, ordering food at a restaurant, and introducing yourself to others are just a few examples of how you will use the language during your trip as you rely on your current knowledge and soak up new information like a sponge. Contrary to popular belief, traveling doesn’t have to be expensive. If you look for deals online, book your flight well in advance, and stay at an Airbnb or hostel, traveling can cost the same or less than if you stayed home (think about the gas, groceries, and utilities you aren’t using when you travel). And, if traveling isn’t an option for you, the next best thing is to take a foreign language class from a native speaking language teacher who can share their knowledge about the culture and traditions behind the target language. Taking a foreign language class is another tried-and-true way of learning another language, especially if your instructor was born and raised in a country where the target language is spoken. At La Paz Language Academy, each and every one of our language teachers not only teaches their native language, but they have also experienced the culture and traditions behind it and bring their life experiences to the classroom. This allows them to teach the target language authentically through culturally immersive lessons that include firsthand accounts, group activities, videos, food, crafts, history lessons, and more. Interested in learning a new language at La Paz Language Academy in El Paso, TX? Check out our language learning programs for adults, high schoolers, children, and corporate groups, and enroll today! We are proud to offer language learning courses for more than 20 languages, including Spanish, French, and English as a second language.